So, the first sprout you saw in my last post is all but gone. You can see it in this picture below. It was the first out of the gate, but the "seed" part never fell off, the leaves never emerged, and eventually the whole thing shrivelled up. Luckily, there were two other plants that sprouted up in the same pod. Although neither of them are showing leaves yet either, so we're still not out of the woods yet. When I looked carefully, I noticed there was a plant wedged underneath the paper cover for the pods (look to the left of the big green sprout in the photo, below the cover). I took a paper clip and gently nudged the plant so that it went through the hole. The plant was pretty weak, but it was also pretty long, having probably grown for days without me having noticed because it was growing under the cover. So this is what tomato pod #1 looks like now. The first sprout to come up is officially dead, but there are three others vying to be the top dog. According to the Aerogarden instructions, only the strongest plant can remain--all others must be pruned. So for the next few weeks, we'll have our own tomatoey version of Survivor. While we're waaaay behind what was promised in the instruction manual as far as timing goes, the good news is, we do have greenery. A few more days, and hopefully we'll see a strong winner emerge. Here's what the other pod looks like. Much better, as the leaves have actually made it on two of the plants. Note that I had to do the paper clip trick to nudge that top plant out into the sunlight. Again, we'll see if the lights and nutrients can get the weak plant a little stronger. If I were a betting person, I'd put money on the lowermost plant though. Will provide an update in a few days. But it looks like they're all out of the gate, with a little help from a paper clip! We've just passed the 14-day mark of the VeggiePro. Right on cue, the unit started flashing "Add Nutrients" and "Water Level Low". I added two nutrient tablets from the one pouch marked "Growing Nutrients" and added a little water to bring the water back to the fill line. I was a bit disappointed because the seed pod says on it that plants should appear in 4-7 days. After 9 days I saw nothing, so I wrote to Aerogarden. Hi. I planted my Heirloom Tomatoes in my new days ago. I still do not see any plants, not even a hint of a plant, even though the label said I should see something in 4-7 days. I have three other Aerogardens, so I know I am doing everything right. What can I do now? It is not unusual for germination to be slower than is expected. I can offer a personal tip as I fill the plastic dome with water and pour the water directly down the center of the hole three or four times a week for slower germinating plants. Always replace the dome to create the little greenhouse effect. If you do not see any germination by the end of two weeks, Please call customer care at 1-800-476-9669 so they can help diagnose the problem when you are with your new garden. Our hours are: 7:00am-6:00pm, M-F, MDT. I admit, at first I was a little skeptical. And then on Day 10, out of nowhere, this little guy showed up. It still doesn't look like the strongest plant, but it's a start. Per the instructions in the manual, I removed the dome. Let's see how it fares over the next two weeks. The other pod was still barren. I looked down inside the pod and saw absolutely nothing. So I followed Aerogarden's suggestion and poured some water right into the pod, and replaced the plastic dome tightly. Right away, I noticed something I didn't before on the VeggiePro (but which I did see in my earlier Aerogardens): little beads of condensation formed inside the dome. This is the "little greenhouse effect" that CJ spoke of, and it's brilliant. I took this picture today. If you look carefully, you'll see an itty bitty little plant forming. Granted it's about 10 days after I expected, but things are looking good. We're not out of the woods yet, of course. I expected 2-3 plants to grow (which would later be pruned), but it looks like each is only yielding one so far. But we'll wait and see a few days and see if these two get strong. Stay tuned! For some reason, this round of gourmet herbs which started three months ago back in June didn't quite live up to previous experiences. The mint and basil were excellent, of course. But the purple basil barely got off the ground, the chives produced only a few thin sprouts, the parsely and thyme popped up but didn't grow at all, and the dill didn't even come up at all. I'm going to give Aerogrow the benefit of the doubt and guess that I just got a bad batch of seeds. I recently purchased a fresh set of seeds, so hopefully my next Aerogarden won't have this problem. I ordered my seeds through Just the Aerogarden Store , so there's less of a risk that it's been sitting in a retailer's warehouse for a long time. Another nice thing about ordering through the Aerogarden store is that you can pick-and-choose your seed kits (perfect for me, as I don't use dill, but I could always use extra cilantro, for example). Anyway, I accidentally destroyed my mint plants, but the basil plant was going strong. Just like in old times, I decided to use up the basil (which has been an overachiever since day one). I took my own advice from June 2008 on what to do with too much basil. That's right--pesto, pesto, pesto! I used the same pesto recipe that I used back then. I picked three cups of loosely packed leaves, taking 40% of the regular basil plant and 100% of the small purple basil plant, and then added the four tablespoons of basil I had frozen. The result is what you see to the right. I put it in the freezer for me to enjoy throughout the next few months. This left the Aerogarden looking like this. I took the remaining chives and thyme, chopped them and froze them. My vast harvest was one teaspoon of chives and half a teaspoon of thyme. The remaining step was replanting the basil plant into a pot. While the other pods were somewhat anemic in their root structure, the basil was certainly impressive. Because I'd chopped off so many of the leaves to use for pesto, I also trimmed a bit of the root. Unlike what I did before, I also decided to leave the plastic on instead of cutting it apart. Finally, it came time to harvest the Mesclun. I chopped the remaining lettuce off every single plant and you can see the beautiful variety of leaf shapes and textures. It produced enough lettuce for two large salads. Once I got that silliness out of my system I threw together some tomatoes, red pepper, Parmesan cheese, and steak (leftover from lunch at Ruth's Chris!) and put some Catalina dressing on. Mmmmm! So now, my Classic Aerogardens are all officially retired. I'll start them again some day, but for the immediate term I'm looking to focus all my efforts on the VeggiePro. The VeggiePro Arrives. Bring on the full-size tomatoes! I was lucky enough to get one of the first AeroGarden VeggiePros delivered to my door yesterday. This is the AeroGarden model that will allow you to grow full-sized fruits and vegetables. In fact, in the coming months, AeroGarden will release new seed kits under its "County Fair" line of seed kits focused on full-sized vegetables, including bell peppers and of course, full-size tomatoes. As a former tomato gardener who's been consigned to apartment living, I made sure to get the VeggiePro with the free Heirloom tomato kit. It was delivered quickly. But happily, the box inside was in great shape, complete with sales slip. As I found with my other three Aerogardens, the package design of the VeggiePro was impeccable. Opening the box, you immediately see a Quick Start guide. The first thing I noticed is that the manual is for the AeroGarden Elite 6 Plus, which confirms my suspicion that the VeggiePro is essentially the same thing as what they'd been selling earlier as the Elite 6 Plus. I'm not complaining, because the price is at least $20 less, and it comes with the Heirloom Tomato kit and the Trellis kit, neither of which were included in the Elite 6 Plus. The box is packaged in layers with different pieces of the VeggiePro. The top layer contains one grow light (these are the new grow lights with more efficient and stronger light spectrum than the old style grow bulbs that I'm used to with my old 7-pod Aerogarden Classics. It also contains the Heirloom tomato kit, with plenty of nutrient tablets, spacers, and two tomato seed pods. 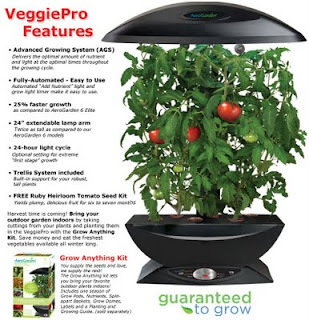 This is similar to what I saw with the cherry tomato Aerogardens--though there are six spaces in the AeroGarden unit for seed pods, only two tomato seed pods are included in order to give the tomato plants plenty of room to grow. The other four slots are filled with spacers that cover the holes so dust and critters can't get in. The bottom layer of the box is the base of the unit, along with the remaining two grow bulbs. Even though I've gotten pretty good at assembling Aerogardens by now, I decided to follow their instructions and read the manual carefully again. Happily, the process was just as simple as it always is. The whole thing took less than 5 minutes. The first step was inserting the arm into the base unit unti you hear a "click". Step two was plugging the grow bulbs in until you hear a "click". The next step was plugging the cord from the base unit into the lamp unit. The next step was attaching the arm to the lamp unit until, you guessed it, you hear a "click". The arm is a lot thicker than the old Aerogarden Classic arm, because it extends to two full feet. Voila! The completed Aerogarden VeggiePro. I decided to put it in a corner of my living room. The instructions clearly state that vegetables needs a solid block of time of complete darkness, so I put the unit in a place where it could be completely dark between about midnight to 8 AM (the light cycle is on for 16 hours and off for eight). Also, I wanted to put it in a place far away from windows so critters won't get any ideas of setting up shop there. This is where my previous Aerogarden experience comes in handy. The seed kit had a beautiful new brochure explaining how to grow the "county fair" line of vegetable seeds. I knew this was "hot off the press" because it had a error sheet correcting a mistake it had made in the book about which slots to plant the seed pods in. Speaking of the seed pods, this is what it looked it. It's much taller than the traditional Aerogarden pods I'm used to. The next step was filling the base unit with exactly one gallon of water. I find that an old, cleaned out milk carton or in this case, a bottle of Hawaiian Punch is very handy for this purpose. Following the instructions on the error sheet, I plugged the seed pods into the front two spots in the unit on the far left and right. The rest of the slots were filled with plant spacers. As with the old Aerogardens, I put a plastic dome on top of the seed units so the seeds don't dry out and get the perfect amount of humidity and light. As with the other Aerogardens, I added the two starting nutrient tablets. Plug it in, and select "Vegetables" on the front panel, and the lights went on and the pump started pumping. That's it. And so, Aerogarden #4 is on its way. Let's hope that the experience is more like the herbs and not so much like the cherry tomatoes or the peapods. AeroGarden VeggiePro - New AeroGarden Model Just Annouced! Okay, I have to admit I'm excited. Today, I got an email from AeroGrow saying that they're on the verge of introducing a new AeroGarden that grows full-sized vegetables, including tomatoes! They're calling it the AeroGarden VeggiePro. Now, those of you who are Aerogarden fans know that such a beast kind of already exists. It's called the AeroGarden 6 Elite +. For all intents and purposes, this is exactly the same thing, except it doesn't have a brushed steel face. That, of course, is for aesthetics only and doesn't affect how the unit functions. You can buy an optional "Grow Anything" Kit to grow anything you like. Those of you have read this blog know that I'm a former proud tomato farmer who's been relegated to apartment living for the last 10 years. Who knows, perhaps this will get me back in the game once and for all. Of course, I'll post a detailed play-by-play account of my experiences as soon as it comes! Click this link to go to the official Aerogarden store to get your own AeroGarden VeggiePro.